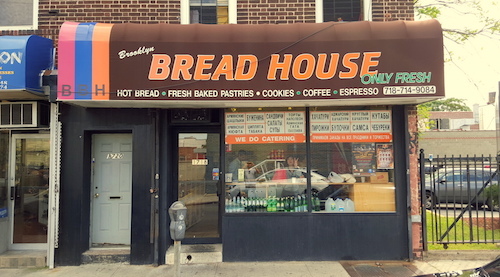 A common passerby of the Brooklyn Bread House might walk past without much second thought if not in the mood for bread or baked goods, not realizing what exotic finds they might procure inside. Hints exist though, and the colorful Armenian flag worked into the awning would be the brightest. 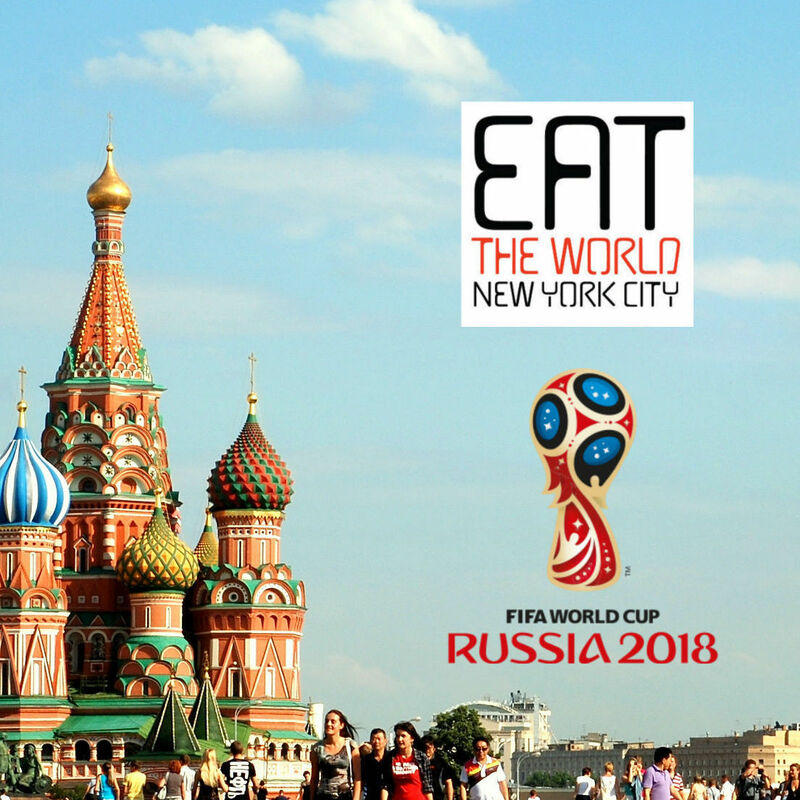 The small Caucasus nation does not have a large representation in New York City, so already there is reason for excitement, and reading some of the Central Asian dishes under the awning is reason for far more. The place really is small, dominated by the steam table that actually surprises to make the "only fresh" on the awning actually seem accurate. Here you can get stuffed peppers and cabbage, grape leaves, and a good variety. The counter has a decent amount of the baked goods on offer and separates the customers from the kitchen. The lady was obviously ready for my order impatiently before I even got to the back, so I tried to form my thoughts quickly. She did a run down of the greatest hits and left it to us to decide despite my request for a recommendation. "NO. This is Armenian place." 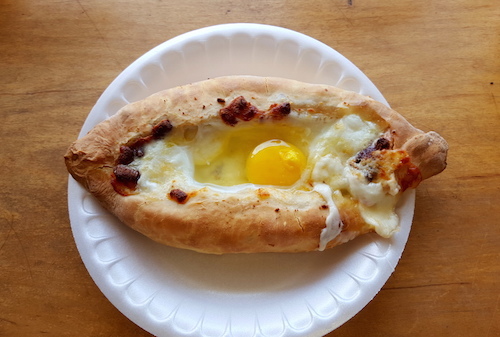 Knowing a conversation about the origins of food was not going to be possible with our lack of common language, I asked for the adgarskii khachapuri ($6, below) and moved on to other items. 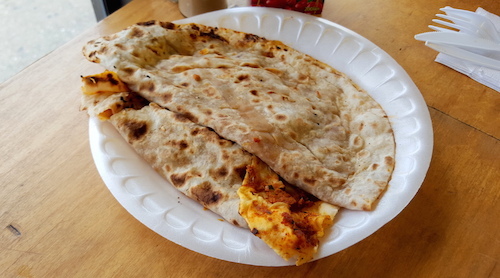 This version is made to order and takes 20 minutes, comes out piping hot, and an egg is cracked fresh on the cheese. I quickly took the picture and we mixed it all up. This is one of those eating experiences that never fails, tearing off the outer chunks of puffy bread to run through the gooey cheese and egg "dip" in the center. The tastes here are phenomenal, it is one of the better versions I have eaten. The sell their lamadzho in packets to go ($9 for six, below), but are willing to warm them up in the microwave for you if you want to eat them immediately. We asked them to nuke two of them for us. The lavash bread is very thin, but flipped over on itself to in this case hold a tasty spiced ground beef. In Armenia, you will see stacks of this lavash bread outside of baker's homes for drying and using in various dishes or storing. Fresh is when you want to eat it though, and the ones used here to make lamadzho qualify for that. On the menu, one of them seems to cost $2.50, and I am not sure if that gets you an even fresher made to order version. 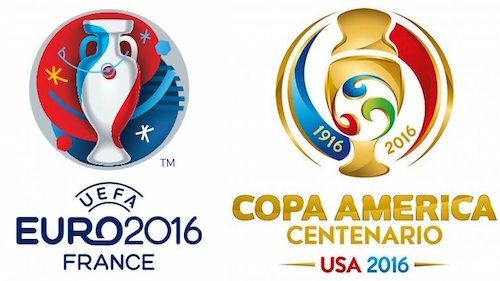 We were happy with our purchase though, and I am finishing another off as I write this post. We did not sample any of the sweet pastries, but almost counting for sweet is the one below filled with "farmer's cheese." I did not catch the name or price, but it was no more than $1, and was absolutely delicious. The sweet creamy cheese was substantial, and again wrapped with similar bread. The rest of the menu here is very lengthy, the place can turn out a pan-Central Asian feast for anyone that wants one. There is only a counter in the window with two seats though, so eating here is the only problem. You'll need to have your diners on hold nearby in your own space. I am always a sucker for sour cherry beverages.